The latest ISO (4.22) no longer works in VB, and setting the iomem=relaxed does nothing. I am also using VB 5.0.18 not sure why the latest one doesn’t work at all with this setting when the previous one did. I get the following error when booting after a ZFS install using the latest cnchi master branch. And ZFS with separate /home dataset does not work as it is not able to mount /home after install. @gavmassingham Yes it appears that iomem=relaxed also makes the GUI load. I didn’t see that there was already a post about it. Looks like I can get the GUI working if I select no KMS at the boot option. Not sure why this is necessary, but I guess it works for now. with the latest nightly iso. All i get is blank screen, but I can switch to the other tty’s. 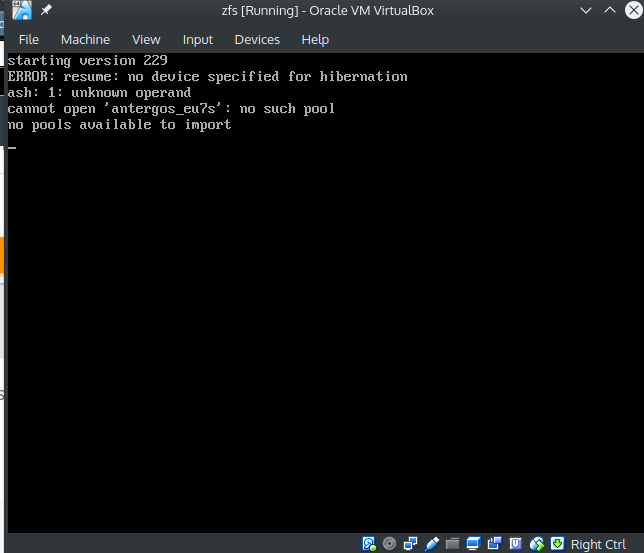 I am unable to boot with the normal iso in virtualbox, but the minimal one does boot. Except, I need the normal one because it has all of the programs in it that I need. How do I install Antergos in virtualbox with ZFS? it’s always greyed out no matter what iso I choose to boot and no matter how much ram I give the VM. Why is this greyed out in virtual box?